Tesla tweeted out a video Sunday morning of its Tesla Model X rolling over after being shoved onto a sandbox by a sled. But even if the tweet read “...the first and only SUV to achieve a NHTSA 5-Star safety rating in every category...” this rollover isn’t the test conducted by the U.S. government, it seems to be a “Soil-Trip” rollover test done internally. Here’s how it works. The soil-trip rollover is a lateral movement of the car into a sand bed. The car is placed on a flying floor and slides laterally into the sand after a sharp deceleration of the sled with deformation tubes. Rollovers were most commonly induced when the lateral motion of the vehicle was suddenly slowed or stopped. This type of rollover mechanism is referred to as “trip-over”. Trip-overs accounted for 57% of passenger car and 51% of light truck vehicle (LTV) rollovers. More than 90% of trip-overs were initiated by ground contact. This happens when a vehicle leaves the roadway and slides sideways, digging its tires into soft soil or striking an object such as a curb or guardrail. The high tripping force applied to the tires in these situations can cause the vehicle to roll over. So it seems like such a test makes sense if you really want to simulate the most likely real-world rollover conditions. What exactly Tesla is measuring with this test shown in the video, I’m unsure, but a paper written by Nissan Engineers for the Society for Automotive Engineers gives a clue of why an automaker might be conducting such a test. According to the paper, automakers could use such a test to ensure compliance with Federal Motor Vehicle Safety Standard 226, whose aim it is to reduce occupant ejection from cars during crashes. Vehicle manufacturers have to define their own test procedures, because FMVSS 226 does not define any rollover test methods.The soil trip rollover test is a vehicle rollover test method in which a vehicle is propelled into a soil pool to measure its rollover characteristics. So perhaps Tesla is testing out their occupant ejection mitigation tech, here. Or maybe not. Who knows. In either case, this test is very much not what got the Model X its five-star rating from NHTSA, because the feds run markedly different tests to get their rollover star-rating. 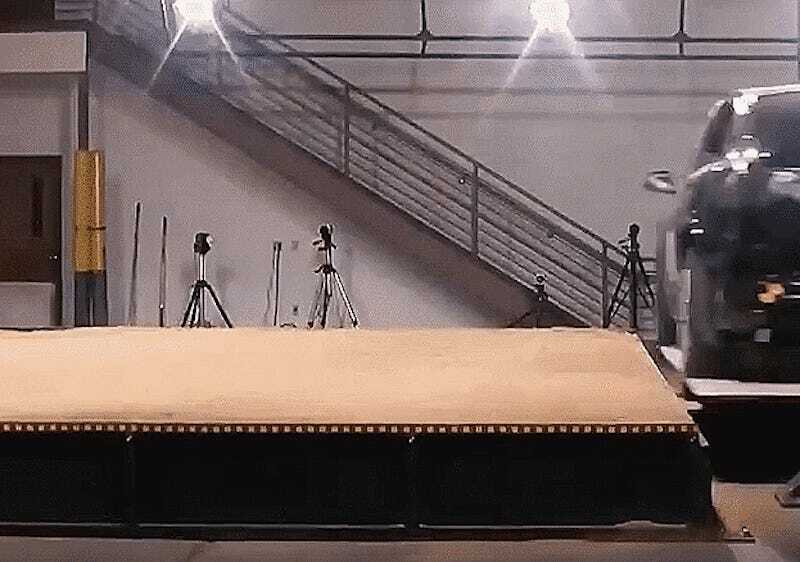 Measuring the track width, T, is fairly straightforward, with the test facility using two “Tire Edge Determination Tools” and a tape measure, with the final result being the average of a bunch of different track width measurements to minimize error. Once researchers have T and H, that’s all that’s needed to come up with a Static Stability Factory, an “at-rest laboratory measurement” that NHTSA says is an indicator of how top-heavy a vehicle is. Under the new rating system, a vehicle can improve its score based on static measurements if it successfully undergoes the fishhook maneuver without tipping up on two wheels. Vehicles are tested with a simulated five-passenger load starting at 35 mph and then in 5 mph increments up to a maximum of 50 mph. In any case, while it’s not a government-mandated test but an internal one and while Tesla’s tweet sort of implies that one relates to the other, the Model X inarguably fares pretty well. I’d rather be in that than the Explorer, government test or internal one. I’ll update this post if Tesla gets back to us on the details of the test.